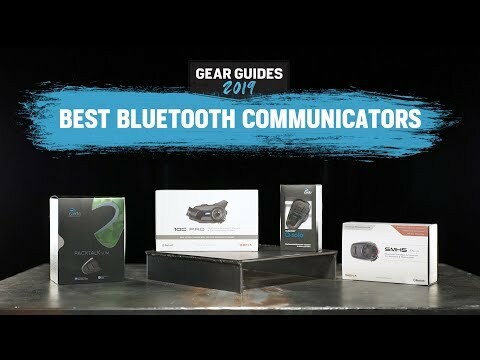 Bluetooth generally is a pretty problematic platform, especially when you're trying to design/build something that needs to communicate with every possible model of smartphone, communicate with like devices, be easily installed inside a motorcycle helmet, and actually sound decent once there. When we got it working, I was super glad to have it. Easy to install in my Shoei, and the sound was clear, although don't expect to be impressed if you're an audiophile. Battery life seems fine so far. Unfortunately, we had huge problems pairing with other SMH-5s – the guys I was riding with have paired multiple times with multiple devices, so maybe that was the issue, but even once we were finally successful in getting them to pair (after turning them off and back on multiple times, switching up which unit was put into pairing mode first, etc. ), opening and closing channels did not work as expected in both directions (I could open a channel with someone else, but they could not do the same going the other direction). The device also paired just fine with my phone initially, but then I unpaired it before I loaned the main unit to someone (his was out of juice), and now I can't get it to pair again using the exact same phone. I need to look into these issues more, but in an age where Apple has set the standard that technology should "just work," Sena's really missing the mark despite what a good value this product could be if it worked properly. Music while riding makes the adventure so much better. Not to mention using it for GPS directions or communication to other riders in a group is clutch! I wish the speaker quality was a little better but other then that it's a fantastic product! Purchase, delivery and install was satisfactory. Very pleased with this item and definitely recommend. The product is nice and the sound is as you would expect for a skinny, low grade speaker, but definitely beats having no sound at all. All of my phone conversation have been good and good clarity on the other end. I have had issues with the speaker wire and losing sound in the ear piece due to the lightweight design. Revzilla is great and the product is okay, BUT Sena customer service? Terrible! Ordered it and got it very quickly. Revzilla really worked with me on my shipping preferences as I have problems getting things via UPS without them being damaged. Revzilla rocks! The unit comes with very limited installation instructions, but I was able to figure it out on my own. The problem started when I tried to update the firmware, which Sena recommends you do in their instructions. I tried everything and could NOT get it to update. I tried Sena's online customer service and did everything they said to do. Still couldn't update. Finally the technician recommended I contact Revzilla for help. How is Revzilla going to help when the manufacturer could not??? Come to find out Sena wanted Revzilla to send me a new unit and eat the old one. That's not right. So, I have been going back and forth with Sena for about a month trying to get them to take it back. First they have to have a picture of the box it came in, then a picture of the packing slip, then a picture of the unit, then a picture of the cash register receipt (something I don't have because I bought it online). This is NOT Revzilla's fault, but Sena customer service stinks! If you buy something from them, I hope you don't need their customer service.! I still haven't gotten my unit replaced. I;m sure they'll come up with something new they'll need just to "follow proceedure". Maybe a pint of my blood. This headset did everything that I wanted it to do, however only for a few days. Even when the headset worked it didn't work well. One of the speakers stopped working after about three days, the other one had a fuzzy quality to it, and the microphone recording is barely tolerable. In an attempt to fix these issues I tried to do a firmware update. The first issue I had with this is that SENA has not had its drivers verified by windows and thus cannot run on windows 10 unless you boot the computer in a particular way. So I ran the install on my fiances windows 8 computer. The software for upgrading sena devices looks like something from the early 2000's, which would be fine if it worked properly. However the software got stuck downloading at 90 percent for several hours. In an attempt to fix this i ran the install again but the damage was done. In attempting to upgrade the firmware, the software completely killed the sena unit and it no longer starts. I went through sena customer service who told me they would process an RMA and get back to me. This was several days ago and I have still heard nothing despite having emailed the initial tech support person again for an update. Apparently sena is known for its poor customer service. Having been through what I have with this product I don't think I can ever recommend a sena product. Keep in mind I bought this product just over a month ago and am already having to deal with this. Got these on sale during the summer. Fast shipping, easy to throw into any helmet, battery last a while. No complaints so far, everything is good. I opted for the SMH5 over the SMH10 because of the price. I ride to commute to work and school, so the bluetooth is to listen to music, talk on the phone should someone call me, and get traffic alerts. This does it all while saving money. I don't use my bluetooth to talk to other riders, so how far the communication distance is and with how many people I can communicate with is irrelevant. The device is nicely configured, easy to use, has good quality audio and have been told the voice quality while on the phone is excellent. The quick start guide is a little confusing and I recommend pulling the full install instructions up online. We've had these for awhile now, I forgot to review~ but these are super easy to use. We can bluetooth to each other and our music, switching between the two is very easy. If you're looking for an affordable com system, check these out. I'm sure they've got newer ones by now, so they may no longer have these. When we do need to replace we'll be sticking with Sena brand. Easy to install, works great. Although I do get an occasional (rare) static from the left speaker. I have two of the same model. Low price and works great for what I needed which was listing to audio books and GPS announcements. I was tired of using earbuds while riding. and i can easily make or take phone calls if needed. Listen to music and GPS directions while riding. Blue Tooth that connects to the iPhone. Basic Model will work just as well as the most expensive. Price mostly. I hope it work well. Get back later. I like listening to music, but with the aux headset I currently have, i cannot take a call if I need to...family likes to check in on my rides every once in a while. So I could use my phone hands free if needed. 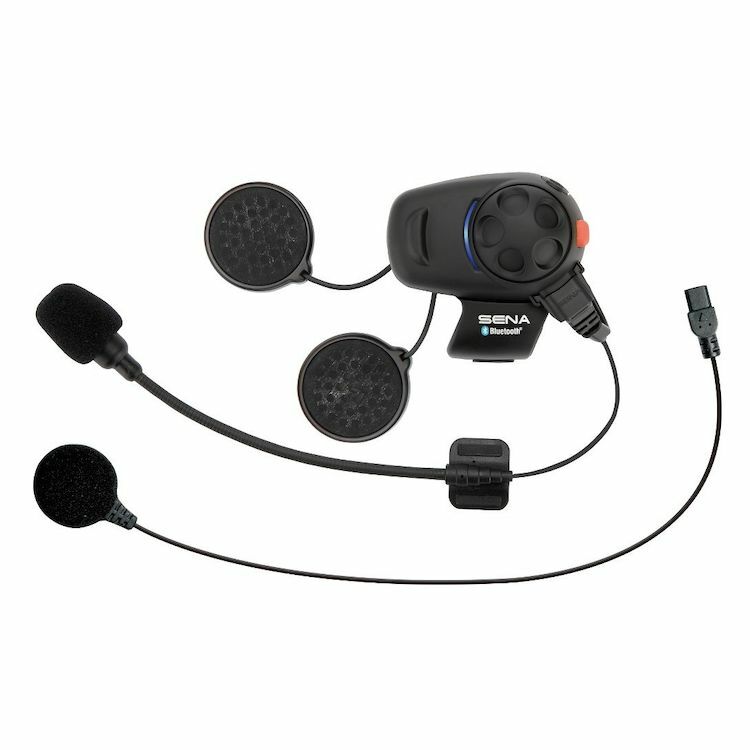 upgrade to bluetooth over the Sena 3S-W Bluetooth Headset - Wired Microphone. worth it! I need to communicate by phone during working hours. ...and I like music. If it's for me, I'll be upgrading to the 10s and Bell Qualifier DLX. I needed a bluetooth headset to mount to my Bell Revolver modular helmet, which I love and don't want to change helmets. I'm hoping it will work (mounting) with this helmet. I want to be able to connect my iPhone 7 so I can have access to phone functions on my daily (long) commutes. Clarity of sound depicted in reviews. How many riders can be paired on the intercom? BEST ANSWER: The SMH5 can be "paired" with up to three other Sena Products (Universal pairing only supports one at a time). However, paired only means that it remembers them. The SMH5 can only establish an active intercom conversation with one other device at a time. In theory, if at least 2 people in your group are using more sophisticated Sena products (e.g SMH10R) , it should be possible to activate intercoms between an SMH5 and an SMH10R, then intercom another SMH5 and the other SMH10R, then conference the two SMH10R units together to get up to 4 people into the conference. (Haven't tried yet to confirm). But an SMH10R cannot conference directly with two SMH5 units simultaneously. per my review, the manual states total of 3 intercoms - you plus three friends, total of 4 bluetooth comm sets. Will it pair with sena 10c? Will this fit a Shoei helmet? I don't consider the unit to be waterproof. can I hook from the sena SMH5 to my kickstart radio and hear the music to my headset ? BEST ANSWER: If the kickstart radio is bluetooth I expect you can link to the sea unit. Otherwise, there are no jack ports on the Sena SMH5unit except for the charging port. Is the wired mic long enough to run in a modular helmet with enough slack that the mic can be mounted in mouth area of the helmet? BEST ANSWER: If you mount the mic on the same side as the unit, yes. I mounted my unit on the left side of my full face Bell and routed the wired mic around the back up to the mouth opening on the right side of the helmet. I don't think the wired mic will fit with a modular helmet in the up position. Is the intercom function for rider to rider push to talk or an open channel like a phone call? BEST ANSWER: It is an open channel, but you cannot listen to music and talk on the intercom at the same time. The only Sena unit with this feature currently is the 20s. You can pair with up to 3 other units and you select which you are communicating with via the jog dial. Once you have selected the other paired unit its voice activated with the paired unit. Would I need 2 of these one for me and one for my wife for us to communicate?? And can we communicate with this without going through our phones or is this a phone type thing where you communicate by phone?? These are very confusing to me. I just basically want a wireless type of communication with my wife while we both are riding together on separate bikes. BEST ANSWER: This will work. It runs it's own Bluetooth channels. The distance isn't the greatest on the 5s but I've ran mine with my buddies with no issues as long as we are. 5 miles like of sight. is the boom mic included as shown in the pic? BEST ANSWER: Yes, kit includes both microphones shown. Could i use this headset on my half helmet? While the main unit might attach to a half-helmet,I personally don't believe that either microphone configuration would lend itself to a half-helmet configuration.